My New Bullet Journal set up works really well to my advantage. I got to see all my tasks and do as many as possible. I didn't miss a day without planning and for me that's a major success so far. Today is another installment on the Basics of Bullet Journaling. I started this series with Guide to Index Page and Keys and now we will be focusing on Monthly Pages. This is another core of the Bullet Journal system for it starts all the planning you'll do in your life. A good Monthly Page can amplify your productivity and avoid stressing too much. There are more than a dozen ways you can create your Monthly Page. Some follow the original method as seen on the Bullet Journal YouTube video which is the vertical style. Others create boxes that resembles the normal calendar view. Again the best thing about the Bullet Journal System is how versatile it can be. If something doesn't work for you on the first time you can easily change it. The best tip is to find inspiration on Pinterest or Instagram on how Monthly Pages are created. Famous Bullet Journalist such as Kara of Boho Berry, Kim of Tiny Ray of Sunshine and Christine of Christine77star are some of my go-to sites whenever I need creative input on my set up. A monthly page also known as monthly log always consist of the date and the task and/or event on the particular day. It should give you a quick view of what will happen over the next 30-31 days. Depending on what layout/method you'll use to log your month all starts with dedicating a page or a spread of your bullet journal to the cause. 1. Make a header for the current month followed by the days and dates of that month. If you choose the vertical method you can list the dates alongside the first letter of the day instead to save space. 2. Now you can use the monthly log to write down special dates like holiday and birthdays. You can also use the monthly log to list important appointments, things to get done and events you have to attend. 4. Don't overdo with your logs. Keep it short and simple to provide a quick view of all entries. 5. You can also create a list of your goals and/or habits you want to track. 6. The best Monthly Bullet Journal set up is the one that works for you. Do not feel pressured trying to copy others. Go for layouts that easily reflects your day to day needs. Make it your own. There's no perfect bullet journal layout you should follow. All bullet journals have its own charm as long as properly used. Set up your monthly spread before a new month starts. Thank you so much. I hope this helps. 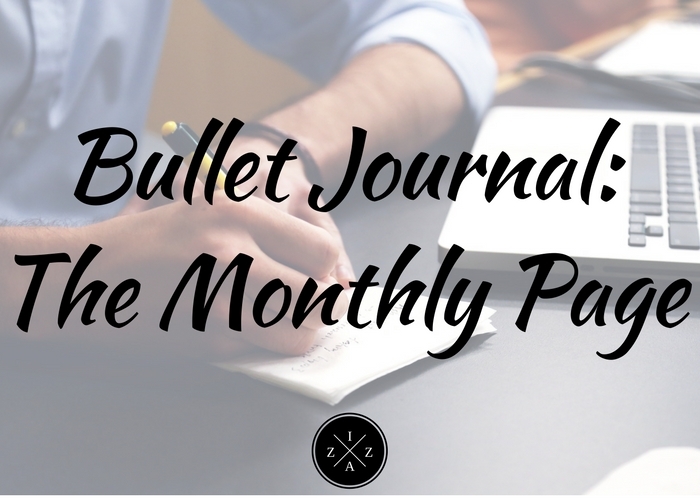 In the Next Bullet Journal post I will be focusing on the Weekly and Daily Pages in the Bullet Journal. Current Makeup Menu - New! | Himalaya Herbals Almond and Cucumber Peel-Off Mask Review | Let’s Talk About Lotion!